Renting a charter bus is a wonderful and enjoyable way to provide transportation for a group of people from point A to point B. Not only does no one in your party have to drive, you also get to sit back, relax, and enjoy each other’s company in the drive to and from your destination. However, not all charter bus companies are created equal, and if you are using the wrong charter rental, you could be putting yourself at risk of one or more of the following disagreeable experiences. 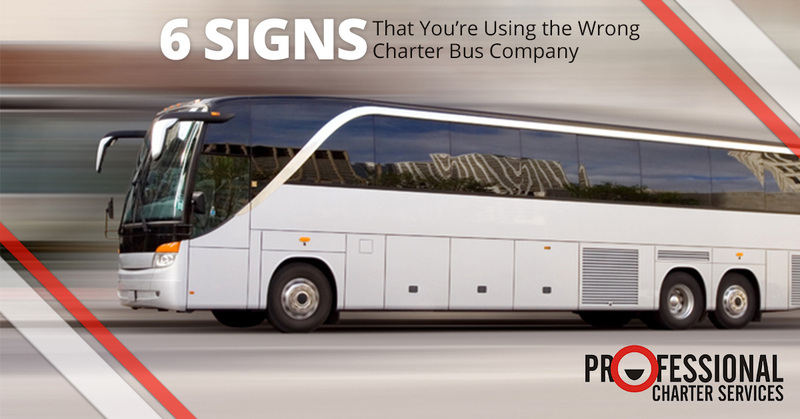 At Professional Charter Services, we’d recommend that you steer clear if you’ve ever experienced any of the following problems with your charter bus rental. Charter bus companies are subject to the same unpredictability as everyone else when it comes to traffic and accidents. However, the most professional charter companies will build enough time into the estimated time of arrival that it will buffer you from almost any level of emergency. Yes, we know we live in San Francisco. Yes, we know that means’ you can’t drive 70 miles per hour on the freeway at most times during the day. The time frame you’re given in your estimate should reflect reality, not wishful thinking. If your charter bus company wants to cut corners, they may hire drivers who aren’t really qualified to drive a bus, much less transport multiple human lives across large distances. Cutting corners is a short-term strategy that might bring immediate gains but long-term loss. You shouldn’t feel uncomfortable with your safety when you’re riding in a charter bus, and the company’s commitment to good drivers will reflect a lot of information about them. Here at Professional Charter Services, we are committed to hiring only the best-trained drivers for your safety. This one truly mystifies us. If a charter bus has restrooms, why on earth would passengers not be allowed to use them? We don’t get it, but if you ever run into a bus company that does this, run away. The longer your trip, the more likely it is that your bus will stop along the way to allow people to get off the bus, walk around, and refresh themselves. However, it’s a totally different issue if your charter bus makes unexpected stops in bad parts of town for seemingly no reason. This is a red flag that should cause you to hesitate to go with that company again. We all hate it when someone tells us one price, only to tack on all kinds of surprising surcharges after the fact. When you get a quote from a charter bus company, it should be your reasonable expectation that if you are clear and upfront with them about what the trip will entail, they should be able to give you clear and upfront pricing. For a clear, logical, and affordable price for your charter bus rental, contact us today. The charter bus company you work with should be able to share with you a clear cancellations policy so that you know what to expect if you need to cancel. If they can’t do this, try a different company. Even worse, if you book a trip with them and then they unexpectedly cancel on you, that’s another red flag that you should avoid. We hope this has been a helpful look at the bad side of charter bus rentals and what you should steer away from. Renting a charter bus in San Francisco is easy! Contact us today for your quote.